Each series has a few features to differentiate itself along with a common set of standard features and optional equipment. 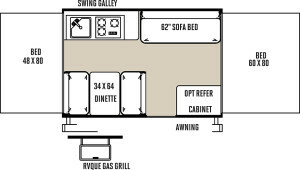 Mac Series 207 floor plan. Courtesy Forest River RV. Forest River’s Flagstaff Mac series is a line of pop up tent trailers designed for budget-minded campers. The line comes equipped with certain basic features across more than a dozen different models that it contains, while offering a laundry list of optional equipment that you can add if you so desire. The Mac series ranges in length from 12 feet to a bit over 21 feet in closed lengths and includes models with 10′, 12′ and 14′ boxes. Dry weights range from roughly 1,732 lbs. to nearly 3,000 lbs., so they are all on the heavier side.